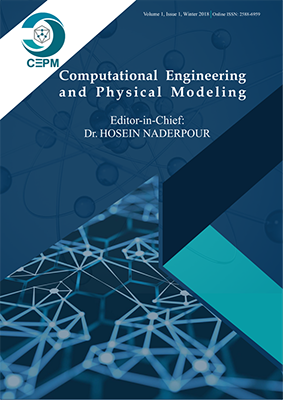 A three dimensional (3-D) numerical model with explicit representation of two distinctive phases is used for precise prediction of the stiffness and Poisson’s ratio of concrete mixture, CM. Using ANSYS code, a 3-D macro scale numerical finite elements model was developed. The aggregates size, shape and distribution are created randomly using enclosing spheres. The sizes of spheres determine the nominal sizes of stone aggregates. Uniform simplified regular spherical stones aggregates are also considered for comparison purposes. The obtained results are compared with experimental and numerical models ones from the literature. The comparison shows a reliable and reasonable agreement. The results are found to be bounded by the upper and the lower bound of the mixtures rule. The results show a close agreement with Hobbs model as well. Therefore, the finite element model perform well under induced compression loading for predicting the stiffness and the Poisson’s ratio of the concrete mix.